Urban parks generate substantial public benefits, yet explicit economic assessments of such values remain relatively rare. Surveys of willingness to pay (WTP) were undertaken to assess such values for proposed new parks. The analysis assessed how preference motives and values varied according to the location of parks. Results revealed greater altruistic motivation and higher overall values for the creation of inner city as opposed to suburban parks. Spatial decomposition revealed that, after controlling for other determinants such as incomes, values generally increase for households closer to proposed parks, but that a significant downturn in values is evident for households located very close to a proposed inner city park; a finding which echoes concerns regarding the potential for such sites to provide a focus for antisocial behaviour. While these findings provide strong overall support for provision of public parks they highlight, the importance of perceptions of location and the potential for localised dis-benefits. Suveys were administered face to face at participant’s homes. This enabled us to remind respondents of their budgetary constraints as well as the existence of potential substitute sites. Participants were informed that “we are researching the value of parks to the people of Norwich” and wished to interview people about their experiences and views.... Participants were shown stock photos of a verdant English park and informed that the park once complete would look like the photograph.... They were asked in an open ended format to explain their choice and to categorise their expected usage of the park into one of four categories.... Interviewers explained that the significant costs of creating the new parks would be met through an increase in their annual council tax bill. The Tobit models produce very similar aggregate values for park A (Mean based = £1,130,674, Tobit based = £1,297,970) when protestors are ignored. The inclusion of a lower bound to account for protestors in the Tobit model also resulted in similar values to the equivalent measure based aggregation (mean based = £933,302 Tobit based = 1,140,256). Results of the CV survey presented in this paper confirm previous findings that parks are highly valued public goods, with the creation of new parks in the city of Norwich having the potential to generate substantial value to residents. 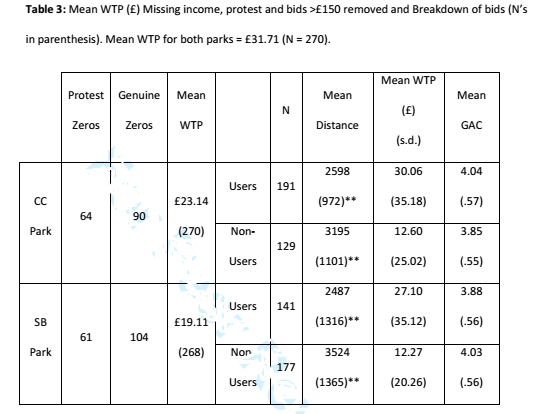 The low protest bid rate in the sample suggests that not only do residents have strong preferences towards the creation of new parks but that, at least in principle, they are willing to pay for increased provisioning through a familiar and realistic payment vehicle. 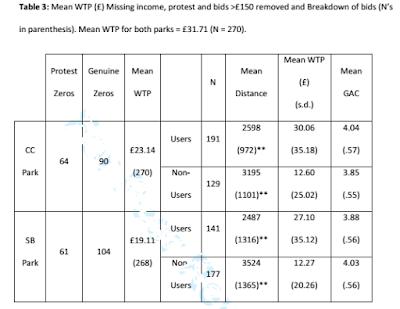 Using an ex ante valuation allowed values and preference motives to be compared for two locations revealing significant differences in both mean WTP and its determinants. Results of a simple choice experiment of which park should be created revealed that 65% of the sample would prefer a park to be created at the CC location. While participants were more likely to choose the park closest to them variations in levels of participant’s environmental concern also had a significant effect on their park choice, asserting the importance of attitudes in preference formation. A preference for the CC location was also evident in WTP bids with significantly higher mean WTP for the CC location than the SB. This overall preference for the CC location may be attributable to the highly accessible nature of the city centre location. While it is also possible that distance is perceived as a sunk cost for the CC park as people visit the city centre for shopping trips regardless.